Jeff Atwood of Coding Horror (a blog dedicated to "programming and human factors," good stuff) describes something he calls the Large Display Paradox: that although pretty much everyone considers larger and multiple monitors to be beneficial, smaller monitors actually enable users to focus better on the task at hand. 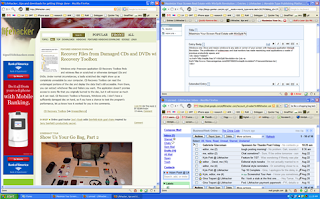 On a smaller monitor, there's no room to have more than one window show at once - so the user picks a task and grinds away at it, with the other windows unable to distract from the task. Also, there's a small amount of time everyone with a large monitor must spend arranging the windows to their liking - I know I do - and even though it's small it'll eventually add up. (And since it's usually done with a mouse, it's not doing anything good for your wrist, either!) So, should we all be switching to old-school 14-inch 1024x768 screens? A one-window-at-a-time speed limit? For our productivity, sanity, and wrist health - and despite our status-symbol huge-screen displays - maybe so! Alt + Tab all the way baby!!! Sometimes a single task can benefit from multiple windows and lots of space (like spreading out your windows in Visual Studio or even when you're just writing something and have another document or two up that you're referring to). So if you're using your multiple monitors to spread out the task you're focused on, that seems okay to me; if you're using it to keep lots of applications up that aren't relevant to your task then that's probably not helping you so much.